She saw me for 5 minutes. didn't listen and gave me a prescription I should have just bought myself in thepharmacy.A month later I get a bill from the lab for tests I DID NOT REQUEST! she tested me for std's and other things that were not discussed. I didn't sign any paperwork for these tests. Ofcourse I had to pay up. By the way they only take cash for copay and charge copay in order for you to receive your test results. I am not going there ever again and I suggest you don't either. She saw me for 5 minutes. didn't listen and gave me a prescription I should have just bought myself in the pharmacy.A month later I get a bill from the labfor tests I DID NOT REQUEST! she tested me for std's and other things that were not discussed. I didn't sign any paperwork for these tests. Ofcourse I had to pay up. By the way they only take cash for copay and charge copay in order for you to receive your test results. I am not going there ever again and I suggest you don't either. The waiting room was so packed that I had to go outside to wait. I just wanted the doc to writeme a prescription refill but did not get called in until 2 hours later. There were women who arrived after me and they were called before me. The waiting room was so packed that I had to go outside to wait. I just wanted the doc to write me a prescription refill but did not get called inuntil 2 hours later. There were women who arrived after me and they were called before me. 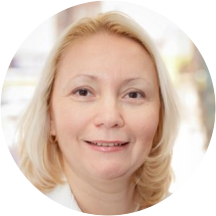 Dr. Yelena Tsyba is a dedicated and diligent OB-GYN serving the community of Brooklyn, NY. Dr. Tsyba obtained her osteopathic medicine degree from the New York Institute of Technology, New York College of Osteopathic Medicine. She also completed her residency in obstetrics and gynecology at Wyckoff Heights Medical Center. Dr. Tsyba is a part of New York Women's Medical Care P.C. Because Dr. Tsyba is bilingual in English and Russian, patients from a variety of backgrounds enjoy having her as their physician. Dr. Tsyba is dedicated to helping patients receive the treatment they need so they can enjoy a positive and fulfilling lifestyle. New York Women's Medical Care P.C. Very nice , the staff were very attentive and the office was clean! She is very sweet and she calmed me down when i was really nervous and she seems very professional! Highly recommended. Dr. Tsyba is Very professional, good listener and her medical staff is polite and professional also. waiting on the results of my tests, so far she was kind enough. Dr. Tsyba is quite good at making sure I understand my medical needs and is ready to answer any of my questions. Great office. Will defiantly recommend it. The wait time was a bit long. However, when I was seen inside, everything went fairly smoothly. The women I saw are all very professional. The doctors was very pleasant and professional . However the one of the receptionists ( young with blonde hair)was really rude to me and got into an altercation with another guest while i was there. She should be fired?? Shes a bad image for business. The doctor was not friendly or personable. She barely said two words to me. I spent more time with other staff and with the physicians assistant, Marina Denysova. In fact, the doctor suggested I have a sonogram, but didn't even speakto me regarding results. I saw the PA for that. Luckily, Marina Denysova is very friendly, warm, caring. If I come back it would only be to see her. However, I came in to see her about a lump I noticed on my breast and was sent for an ultrasound. I did not hear from the office about the results (it's been a month). I went on my own to get results as soon as they were ready and needed to see a surgeon for a follow up because the results were suspicious. I even received a letter from the Imaging place letting me know to follow up with a surgeon and that a copy of the report has been sent to the referring doctor. They never reached out to me to alert me of the suspicious results. If I wasn't overly cautious I would only have known something was up from this letter a month later. I had a wonderful experience. The staff was friendly and polite. The doctor listened to all my concerns. First visit, I waited over two hours. Follow up appointment was rescheduled in less than 24 hours of the scheduled appointment made 2 weeks in advance. Receptionist who rescheduled me was impatient & rude. Finally have my follow up another weeklater. There are so many people in the waiting room, I have to sit on the floor after a 12 hour work day. I wait for TWO HOURS & FIFTEEN MINUTES before I finally complain. Dr. Tsyba took less than a minute to "go over my results" & said "That's it, everything is good." No apology. No acknowledgement of my time being waisted. This is hands down, the worst office I have ever been to. Never. Never. Go here. The doctor was very professional, kind and patient person. she took time with me and answered all my questions without rushing me. all her staff were great and very friendly. I would highly recommend this doctor! Staff was very welcoming and friendly. The doctor is very knowledgeable and definitely knows what she is doing. She also took her time and explained everything what was unclear to me. The whole stuff was very caring and attentive, it feltlike a little family. I will definitely come back! Highly recommend! You will feel very comfortable here! They made me take a pregnancy test even when I told them I haven't been sexually active for more than a year. They made me take a transvaginal ultrasound while I had a yeast infection which was EXTREMELY PAINFUL and toreme up on the inside bleeding. The doctor never smiles, not warm at all. Staff was very kind and made me feel very comfortable. Dr. Tsyba is so nice, she answered all my question and consurnes. Thank you! The whole team at the office was so polite and showed concern about me and I didn't feel like they were there for a paycheck. They actually care. Great friendly staff and the dr was amazing she has patience and is very understanding she takes her time with you when you need it! I am very happy to have found a great gyno! Great doctor . Caring. Super professional. Been with her for years !! I arrived to a lobby full of clients. Myself and one other lady was standing. There was two Ottoman full of magazines. Upon a ressian client arrival, the Russian receptions clear only enough for her to seat. The other lady gota seat when someone was called inside to see the doctor. Once she realized it would look bad with me along standing she came back out and move the remainder of the magazine for me to seat. Others stated that the weight time is always over an hour. Mines was over 2 hours. I left 3 hours later. Never again. She was nice, Made me feel comfortble. But she didnt really answer my questions that i had After a Check up. Highly recommend dr. Yelena and her team!I got full examination.All are professionals,gentle and kind.The office is clean and respectable. Thank you very much. The wait was not like how I have experienced in the past. But the Doctor and staff were punctual knowledgeable and made me feel comfortable.